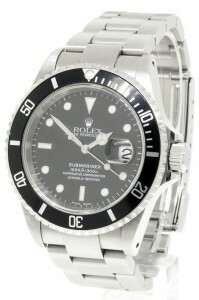 Ah, the Rolex Submariner. Celebrated as the most popular and iconic of Rolex watches, the Submariner has made numerous film appearances, including on the wrist of the man himself, James Bond. The watch appeared in 11 Bond movies overall. Created as a professional diver’s tool with a water resistance level of some 1,000 feet, this Rolex watch made its debut in 1953 and continues to captivate fans. Submariners come in a range of metal options, including stainless steel, 18K yellow or white gold, and two-tone (18K yellow gold and stainless steel.) The Rolex Submariner made a film appearance on the wrist of Robert Redford in All the President’s Men; Redford also modeled Rolexes for an ad campaign. The watch was a favorite of legendary actor Lloyd Bridges, as well as his son, Jeff Bridges. The younger Bridges wore the watch in both King Kong and the more recent Crazy Heart, the latter performance won him an Oscar. 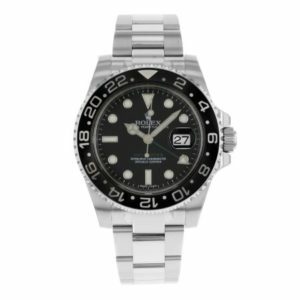 Rolex Submariner has also found its way to the small screen, as it was worn by David James Elliot in the hit CBS series JAG. Launched in 1945, the Rolex Datejust has been called “the forefather of modern watches” and remains a favorite ladies Rolex option. The first wristwatch to feature a self-winding chronometer and date display window on its dial, the Datejust is available with or without diamonds and remains one of the most well-known, recognizable watches on the planet. This classic option has also made numerous silver screen appearances, including on Paul Newman in The Color of Money and Christian Bale in American Psycho. Newman’s love of Rolex was so well-known the company crafted a Daytona watch especially for him! More on Daytona later…. Who doesn’t love a watch named after a yacht? 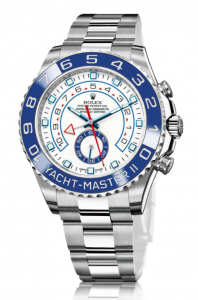 The Rolex Yachtmaster II is a perennial favorite and best-seller, and was inspired by the “luxurious yacht-capades of the 1950s.” Hailed for its excellent, “cutting-edge” features, including a bidirectional rotating bezel, trip lock winding crown (waterproof enhancer) and par chrome oscillator hairspring, which makes it resistant to magnetic fields and shocks, the watch’s advanced features are offset by its elegant design. Available in stainless steel and platinum, stainless steel with black coating, stainless steel with colored dials and yellow gold models among other options, it’s hard not to love the Rolex Yachtmaster II. The Rolex Daytona is easily one of Rolex’s most iconic models, and a heavy favorite of celebrities, including the aforementioned Paul Newman, who had a Daytona named after him. Engineered as “the perfect timing tool” for race car drivers, it’s no wonder Newman loved this model, as the actor’s other passion was car racing. Launched in 1963, Rolex Daytona watches feature ridiculously-accurate chronograph and tachymeter scales racers use to precisely measure their speeds. 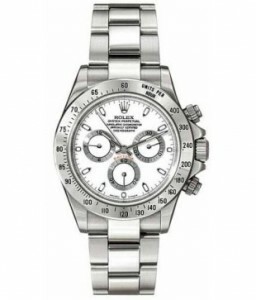 Considered one of the highest-quality watches by the racing world, the Rolex Daytona is frequently seen on the wrists of actors and musicians, including John Mayer, who owns a Paul Newman model, as well as James Woods, Jet Li, Jay-Z, Rob Lowe, Tim Allen, Leonardo DiCaprio, Matt Damon, Brooklyn Decker, Channing Tatum, January Jones and many, many more. The watch is available in two-tone and stainless steel options among others. The Rolex Oyster Perpetual GMT (Grand Master Time) watch was created with the folks at Pam Am airlines in 1954. Designed for pilots and navigators, the GMT features the unique “4th hand” to tell time no matter what time zone you’re in! The time tracking feature makes it possible to tell time in three zones at once, and the watch comes in both jubilee and oyster bands. A favorite of celebrities and revolutionaries in addition to pilots, this Rolex model comes in 18k yellow gold, stainless steel, or two-tone (18K yellow gold and stainless steel). GMT models also come in a number of different-colored bezel inserts, including “Pepsi” (red and blue), “Rootbeer” (brown), and “Coke” (red and black). Argentine revolutionary Che Guevara wore a Rolex GMT, which is also a favorite of “tough guy” action stars, including Clint Eastwood, Keanu Reeves, and Daniel Craig. Considered the ultimate accessory for world-travelers, the GMT-Master II continues to sell in high numbers. 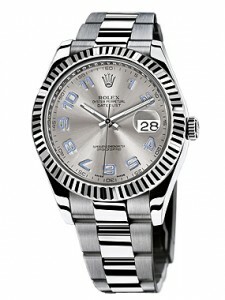 Rolex remains a perpetual favorite the world over, and is undoubtedly the watch of the 20th century. As the brand makes its way through the second decade of the 21st century, it will be interesting to see what new and fabulous features its watchmakers come up with!